Thermosets are a key group of polymers. Understanding how their chemistry and structure affects their properties is essential to their manufacture and use in a range of applications. Thermosets: Structure, properties and applications reviews both factors affecting thermoset properties and how this understanding can be used to engineer thermosets for particular uses. Part one reviews mechanical and thermal properties, the use of chemorheology to characterise and model thermoset flow behaviour, and the role of nanostructures in thermoset toughening. Applications of thermosets are the focus of part two, including the use of thermosets in the building and construction industry, aerospace technology and as insulation materials. Thermoset adhesives, including epoxy resins, acrylates and polyurethanes are also discussed, followed by a final review of thermosets for electrical applications. 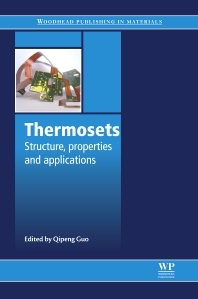 With its distinguished editor and international team of expert contributors, Thermosets: Structure, properties and applications is an essential guide for engineers, chemists, physicists and polymer scientists involved in the development, production and application of thermosets, as well as providing a useful review for academic researchers in the field. Professor Qipeng Guo holds a personal chair in polymer science and technology at Deakin University, Australia. He is a Fellow of The Royal Society of Chemistry and has an international reputation for his polymer research.